Casa Ida, a former canary cottage and recently restored, now forms an ensemble of 5 individual houses. 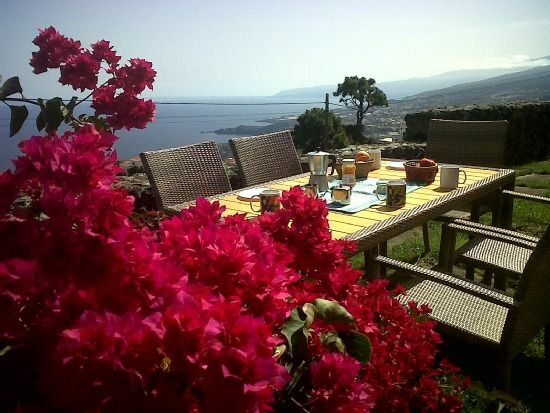 Located 400 m above sea level andsorrounded by fruit trees and gardens which are out on various terraces, ithas marvellous views of sea an mountain Teide. Each house contains a living-room with integrated kitchen, bedroom with twobeds and a bathroom, and it is equipped with central heating, tv (languages)and spare bed. The stylish decoration and rustic furnitures create a warmand cosy atmosphere. Casa Ida has a barbacue´s area nd various terraces. Playa de San Marcos, a beautiful beach in the north east, is about 4 km away. A little further away you will find the beautiful village of Garachicowith its natural swimming pools. The region is ideal for all kinds ofmountain and sea activities. Accommodation was spacious and in good order and the gardens are well-kept. On clear days the views of the sea and Mt Teide from the veranda were lovely. The downsides were that the house was dusty and damp, and there were mosquitoes so you couldn't leave your window open at night which made the bedroom too hot and stuffy to get a decent night's sleep in (no air con). There was no jacuzzi as promised. Lighting outside the house at night was poor and the house is VERY isolated, you have to drive EVERYWHERE - there is no local cafe you can walk to and the local shop was either shut or for local people only as far as we could tell. The village, Genoves, has little going for it. The local people's dogs barked a lot which spoiled the potential tranquility of the place.The worst thing about the holiday was the driving. Access to the house is via a VERY steep road on a corner and the driving in the area is very difficult with switch-back roads and a 50 mins drive on these to get to the sunny south side. Exhausting. The positives were that if you stay here you sample the "real" Tenerife and there are some nice places to visit in the area (Garachico and Masca). The accommodation is traditional and is nice from that point of view if that's what you want but could do to be updated e.g. new TV (with one English-speaking news channel perhaps!). I wouldn't recommend this for families or if you are travelling with older relatives because the house is on a steep hill and you can't walk anywhere. Wegen nichtgehender Heizung hat sich meine Frau erkältet. Da überdies die ganze Wohnung in einem siffigem Zustsnd war (verrostete, teilw. defekte 2 (!) Herdplatten, Ameisen liefen überall und kamen auch aus Thermostaten, Küchenausstattung mit Besteck etc. unterirdisch Typo Campingplatz, Whg. roch in Decken und Bettzeug nach Rauch, obwohl NR- Whg. bestellt war), wollten wir die Whg. am übernächsten Tag verlassen und teilten dies dem Verm. mit. Dieser hatte anscheinend am Abend vorher mal richtig hochgeheizt, so dass die Whg abends 21.00 dann warm war. Auf alle anderen ihm benannten Probleme ging er nicht ein und verweigerte sich unserer Bitte, die Whg. für eine Vermietung erneut online zu stellen und uns einen Teil der bereits komplett vorab bezahlten 6 Resttage zurückzuzahlen. Wir empfinden das als sehr unfair, da wir angesichts des desolaten Gesamtzustandes am 2.Tag ja nicht wissen konnten, ob wir für die insgesamt 7 noch gebuchten Tage überhaupt eine funktionierende Hzg. haben würden (diese lief dann nur abends ein paar Stunden, d.h., man konnte nichts selbst einstellen!) und uns deshalb bereits eine andere Unterkunft gesucht hatten - immerhin war das unser gesamter Urlaubsrestzeitraum. Man muss wissen, dass in Garachico die Nächte sehr kalt sein können und auch am Tage oft ein kühler Wind weht. Ungeheizte Häuser sind dort im Jan. jedenfalls sehr ungemütlich. Casa con encanto, buena limpieza con todo lo necesario y excelente localizacion (la casa y toda la zona de la isla es espectacular ) Barato a mi parecer. Hola, mi novio y yo pasamos una semana maravillosa en Casa Ida. El apartamento era como en las fotos y como la descripcion indicaba. Ademas la localizacion del lugar es perfecta,desde alli se llega bien a cualquier parte y ademas esta apartado de los centros mas turisticos con el mar a un lado y el impresionante Teide al otro. Ida misma, la propietaria, fue muy amigable y de mucha ayuda dandonos buenos consejos sobre lugares para comer y visitar.Cuando volvamos a tenerife gustosamente nos volveremos a alojar en casa Ida. Todo muy bien. buen trato, vistas esplendidas, la casa acogedora y limpia y toda la zona alrededor de gran encanto.